The National Concrete Masonry Association has launched a free continuing education course for design professionals hosted by AEC Daily. 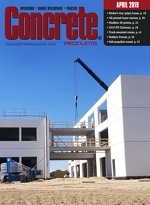 “Concrete Masonry: The Energy Efficiency Solution” educates users on the thermal benefits of concrete masonry assemblies and energy code compliance options. It qualifies for continuing education credits through the AIA/CES system, and is U.S. Green Building Council-approved for Green Building Certification Institute CE hours. Cemex USA officials assembled just after Labor Day in Brooksville, Fla., to mark the producer’s first U.S. admixture blending and packaging facility. The automated, 21,000-sq.-ft. plant will ultimately supply nearly 160 ready mixed plants throughout the Florida and Mid-South regions, shipping up to 16 normal or high range water reducers, setting accelerators or retarders, air-entraining agents and specialty agents by tote. Command Alkon has named Dexter Bachelder as vice president, Contractor Solutions, responsible for growing the information technology provider’s mindshare in the contractor vertical and championing the value of a digitally integrated bulk material supply chain. He joins Birmingham, Ala.-based Command Alkon after 11 years with Aconex, a collaborative construction and engineering management software developer where he served as senior vice president, Global Business Development.